The Charlotte Stone Crabs came from behind to grab a 5-4 walk-off victory against the Clearwater Threshers on Monday night at Charlotte Sports Park. With the win, the Stone Crabs now move into a first place tie with the Bradenton Marauders. Clearwater took the lead in the third inning. Anthony Gose doubled to left then later scored on an RBI single by Tim Kennelly. Kennelly moved around the bases and then scored when Cody Overbeck grounded out to second, giving them a 2-0 lead. The Threshers added to their lead in the fourth inning. Jim Murphy doubled to center to score Darin Ruf an increase the lead to 3-0. But Threshers matched runs an inning later when Derrick Mitchell struck a solo home run to left field to extend the lead to three runs, 4-1. 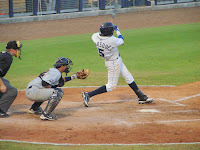 The Stone Crabs kept digging and tied the game in the seventh inning. Michael Sheridan and Hall singled to put runners on the bases. Isaias Velasquez then hit his fourth triple of the season, scoring both runners. Velasquez would later score on an RBI single by Beckham to tie the game. Then in the bottom of the ninth inning, the Stone Crabs struck once again. Velasquez drew a two out walk to get things going. Velasquez advanced to second on a wild pitch then stole third base to move closer to home. Beckham then drew an intentional walk to give the Stone Crabs runners on the corners from Reid Fronk. Fronk delivered a line drive single to right field, scoring Velasquez and giving the Stone Crabs the 5-4 walk-off victory. Frank De Los Santos made the start, pitching 6 innings and allowing 4 runs on 8 hits with 3 strikeouts and 2 walks. Neil Schenk followed with 2 scoreless innings and surrendering 1 hit while striking out 5. Josh Satow earned the win, improving to 3-1 with a no-hit inning and striking out 2 of the 3 hitters he faced. The victory combined with the loss by Palm Beach and the rain-out for Bradenton have moved the Stone Crabs into a tie for first place of the FSL Southern Division. With twelve games remaining in the first half of the season, the Stone Crabs look to hold on to the top sport to clinch a playoff spot. The Stone Crabs will go for the sweep against Clearwater on Tuesday night at Charlotte Sports Park. Matt Moore (0-7, 6.63) will get the ball for Charlotte facing the National League's 2009 Rookie of the Year, JA Happ starting for Clearwater on an MLB rehab assignment.